When you’re looking for a catering partner, we realise that the choice of which food options to give your guests can be a little daunting, so for this reason. We have put together a number of optional food menus for you to choose from to make things a little easier for you. Don’t worry, if there is something you don’t like or would like including, all you need to do is let us know and we’re often more than happy to accommodate most requests and alter our menus to suite any taste and requirements. The easiest thing to do is to get in touch with us using our contact form, or by phone or email and talk over your requirements. The website gives a general overview or what is available, but by talking to you, we should be able to better understand and serve your requirements. Because we have always been open, willing and able to go the extra mile to ensure that every client gets the catering they require and want! 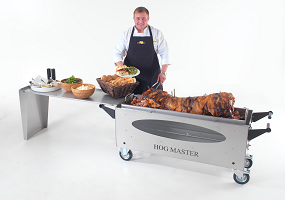 Yes we’re a “Hog Roast Catering Company”, but we offer so much more than the traditional Hog Roast. A quick click through our menu options will open your eyes to what is on offer. There’s nothing that we can’t do, some of the best up and coming chefs and waiters work for our company, using our own industry leading hog roast machines. Together, we’re able to provide our customers and their guests with great tasting food that’s nothing short of excellent. It’s one of the reasons that the majority of our customers rely on us, time after time to cater for each of their events. The set menus we have are in three different categories – Party menus, Wedding Menus and Corporate Menus.Whether your event is considered one of those three or not. We can cater for just about any type of event. The menus are also completely flexible, so if you prefer something in the Corporate Menu for example for your Wedding. That’s absolutely fine, these are not set in stone. When designing these menus, we used our many years of experience of what previous customers had often requested to customise and refine each of the menus. We like to think because of this, we have something for everybody and it doesn’t matter to us who you are or what you need, we regularly go out of our way to reach your requests. If the set menu’s that we have on offer aren’t to your liking we will happily make alterations until you’re happy, or even manufacture a new and unique menu for you if you’re really in need of something different and out of the ordinary. We offer everything from a four course meal with a champagne reception and end of evening bar to a simple hog roasted pig sandwich with stuffing, a special apple sauce and best of all the scrumptious, famed crunchy crackling. Food is as much a part of our culture as anything else and we more than do our bit as contributors with our delicious hog roasts. Have a look at some of our set menus and see if anything tickles your fancy, we have an online query form that you can complete with some details of your event. We will take a look at the number of people in attendance, day of week, time of year and your menu option, and get back to you as soon as possible with a price for your event. If you aren’t decided on a menu you can leave that bit out and we’ll give you several prices for suggested menus based on your event size and type. Usually queries are returned on the same day, or within 24 hours if processed later on in the day. Through our experience and a bit of common sense we know that sometimes organising and planning an event can be rather stressful and time consuming. We aim to take as much weight of your shoulders as possible – We’re always around to assist you by answering questions and throwing our opinion into the hat if you’ve yet to finalise your event details. Having catered thousands of events, we’ve built many relationships and friendships with a number of businesses and can help you in hiring good quality venues, marquees, bar staff (we can even do this ourselves), music and more. Once you’ve made your decisions and the event is finalised we will arrive on the day of your event up to 6 hours before (depending on the menu and party size) the arranged serving time, so that we can ready ourselves and prepare the fresh food on site, without disruption. When we’re done we’ll leave quietly and in a regimented and professional manner, so not to disrupt your event when packing up. Have a look at our set menus, see what you think and either give us a call or fill out our price form. We’ll give you a quote as soon as we can and it will only take a few moments of your time.